Canada’s federal animal slaughter regulations are about to be repealed and replaced with the “Safe Food for Canadians Regulations”. 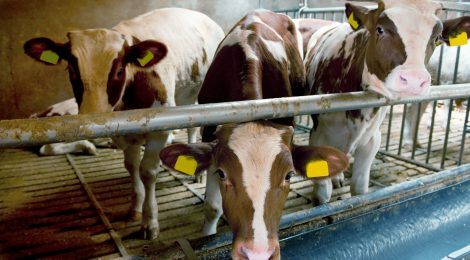 The draft regulations focus almost exclusively on food safety, barely addressing the welfare of the animals being killed. Over 700 million farmed animals are slaughtered in Canada each year. It’s important we speak for them and tell the federal government that their welfare matters. Below are our recommendations. Feel free to use them to develop your own, then email your comments to Dr. Richard Arsenault, Executive Director, Domestic Food Safety Systems & Meat Hygiene at CFIA-Modernisation-ACIA@inspection.gc.ca by April 21st. Make video cameras mandatory in all areas where animals are unloaded, held, stunned, and killed, as France has. All unloading of animals must be conducted under the supervision of a CFIA veterinarian and must be conducted in a manner that does not present a welfare risk to animals (currently, the draft regulations only speak to food contamination and do not require a government official to be in attendance). Clean, potable water must be immediately available to all animals, including chickens and turkeys. All persons involved in the handling and slaughter of animals must receive humane animal handling and welfare training annually. Animals must never be hit with a fist, open hand, plastic cane, chase board, tattoo slapper or any other instrument, including shovels, metal rods, etc. Animals must never be kicked. Electric prods must never be used on any animal, regardless of the species or situation. Animals showing signs of suffering or injury or who have been condemned must be humanely euthanized immediately where they lay by a CFIA veterinarian (currently, the draft regulations allow these animals to be taken to the slaughterhouse floor to be slaughtered and processed). All animals must have enough space to lie down comfortably at the same time. Electrified stun baths for poultry must only be used if they can ensure that each bird receives an average current of 100mA for 4 seconds (this has effectively stopped the inhumane use of electrified stun baths for birds in the Netherlands). A back-up method of stunning must always be available for all species. Birds must never be suspended by their legs. No animal may be ritually slaughtered without first being rendered unconscious. No animal may be slaughtered without the required documentation (the draft regulations allow exceptions for equines, birds and game animals, which is contrary to the existing Meat Inspection Act. The documentation required for equines is specifically intended to prevent horses who have been given banned substances from being killed as their meat cannot be consumed. Asking for the paperwork after the fact would lead to the killing of a potentially high number of horses who would otherwise not have been killed).